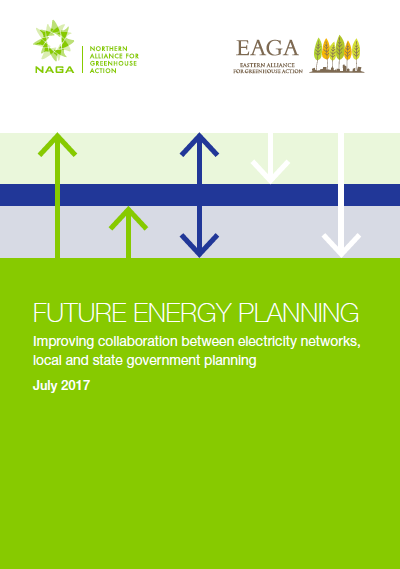 The Future Energy Planning project sought to build better collaboration between electricity networks and local government planners, in Victoria. Currently, electricity network planning and land-use planning currently occur in isolation, meaning long term, viable and sustainable options for integrating demand and supply side opportunities are missed. establish a replicable process for the identification of integrated energy solutions not currently supported by the existing regulatory processes. This project was funded through a grant from Energy Consumers Australia (ECA) and is being led by the Northern Alliance for Greenhouse Action (NAGA) with support from the Eastern Alliance for Greenhouse Action. The final report is available by clicking the image on the left.